Sam's Club is shutting down 63 stores, and some employees and customers say it did so without warning. In a press release issued Thursday evening, Walmart (WMT), which owns Sam's Club, said 12 of the 63 locations will be converted into fulfillment centers. The move reduces the number of Sam's Club locations in the United States to 597. Walmart spokesperson Greg Hitt estimated that roughly 9,450 people are employed across the 63 stores. Workers and customers learned about the store closures on the same day Walmart drew praise from the White House for raising pay and giving out worker bonuses because of the new lower corporate tax rate. Early in the day, news broke about the sudden shutdown of an unspecified number of Sam's Club locations. Sam's Club, using its official Twitter account, at first said that 53 locations were being shut, and 10 would be converted into fulfillment centers. Those figures were later revised in the Walmart press release. Throughout the day, customers took to social media with questions about why their local Sam's Club stores were closing. 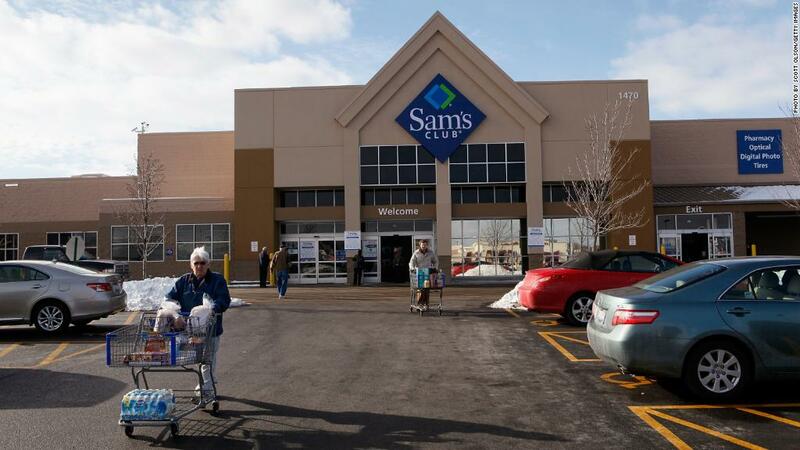 Some demanded refunds for their Sam's Club memberships, which cost between $45 and $100 a year. Sam's Club replied to some questions with a brief statement. "After a thorough review of our existing portfolio, we've decided to close a series of clubs and better align our locations with our strategy," Sam's Club wrote in one reply. "Closing clubs is never easy and we're committed to working with impacted members and associates through this transition." The company also said via Twitter that pharmacies at Sam's Club locations will remain open for "at least two weeks" while the company works to transfer prescriptions and contact customers. In the press release, Walmart said it will offer "support and resources to those associates who are affected, including the bonus announced today and 60 days of pay, as well as severance to those eligible." The federal Worker Adjustment and Retraining Notification Act requires big employers to give workers 60 days notice before closing a plant or issuing mass layoffs. Sam's Club posted one such alert, referred to as a WARN notice, to the Indiana state government's website. That notice says three locations in the state were slated to be closed on January 26. The move will impact 419 employees. Several other states where CNNMoney confirmed stores will be closing did not have such notices posted as of Thursday afternoon. Hitt, the Walmart spokesperson, told CNNMoney that he was unfamiliar with exactly where Walmart issued WARN notices. But he said the company would have issued them "where appropriate." Throughout the day, local news outlets across the country -- including from Houston, Syracuse, Baton Rouge and Dallas -- reported that closures happened without notice. Some reported that bewildered employees showed up to work to find out they no longer had a job. Alex Corona -- who has worked in the tire department at a Sam's Club in Wheeling, Illinois for six years -- told CNNMoney he walked into work Thursday to find the door guarded by two security guards with a sign saying the store was closed. Eventually, a manager vouched that he was an associate and he was allowed inside, Corona said. He said he and his coworkers were told by a representative from Sam's Club's corporate office that their store was closing. Employees were offered severance based on how long they had been employed at the store, or the opportunity to transfer to a nearby location, Corona said. For his part, Corona, who made $12 per hour at Sam's Club, said he's not looking to transfer. "I don't want to deal with Sam's Club," he said. "What they're doing is absolutely wrong." Corona said he will still be working at the store until it closes on January 26, a requirement to receive his severance. Hitt declined to provide a list of addresses for the 63 Sam's Clubs locations that will be shut down. Thirty-nine stores called by CNNMoney had recorded messages saying the store was closed Thursday but would reopen Friday. When asked about this message, Hitt confirmed stores were shut down for one day so that management could inform employees about the decision to close the location -- but the "majority" will reopen Friday to begin liquidation sales. Nine stores said they were closed effective Thursday, and two more said they would close January 26. Later -- when asked about Walmart's double-barreled decision to raise wages but close Sam's Club stores -- White House press secretary Sarah Sanders praised the company. "They raised minimum wage," Sanders told reporters at a press briefing. "They are increasing salaries to over a million American workers. We think that's a positive." Treasury Secretary Stephen Mnuchin also thanked Walmart for raising wages and pointed to the move as evidence that the new Republican tax law is good for American workers. The law, which passed before the New Year, offers companies a drastic tax cut by bringing the corporate rate down to 21% from 35%. --CNNMoney's Chris Isidore, Kathryn Vasel, Jill Disis and David Goldman contributed to this report.